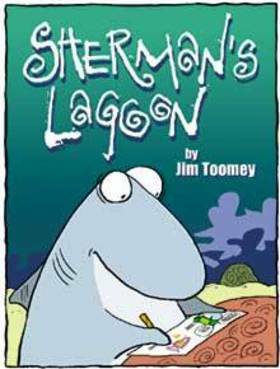 NASSAU, Bahamas - Syndicated cartoonist Jim Toomey, whose Sherman's Lagoon comic strip appears in more than 250 newspapers in over 30 countries, will be in The Bahamas this week to push for increased shark protections. The artist will speak at several public forums and will visit with schoolchildren in Long Island and Nassau. "The Bahamas has something wonderful in its waters, something very few countries have," said Toomey. "Because the government banned longline fishing, the shark populations off the Bahamian coast are still relatively healthy and the marine ecosystem is more intact here than almost any other place in the world." 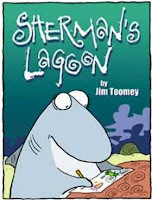 Toomey's cartoon features a great white shark that lives off of a fictional island in the Palauan archipelago. In the real world, the Pacific island nation of Palau established a sanctuary for these animals in 2009. More than 40 different kinds of sharks can be found in Bahamian waters, including the whale shark, the great hammerhead and even great whites. Toomey is joining efforts spearheaded by the Pew Environment Group and The Bahamas National Trust to establish specific protections for the species; none currently exist. "Under Jim Toomey's direction, Sherman and his friends confront all of the damage and indignities that we heap upon the underwater environment," said Eric Carey, executive director of The Bahamas National Trust. "Beyond the cartoon page, we need better marine protections so that the sharks can continue to keep our oceans healthy. That should start no other place but here in The Bahamas." "The waters of The Bahamas were once known for buried treasure and pirate ships," said Jill Hepp, manager of Global Shark Conservation for the Pew Environment Group. "But living treasure can now be found swimming freely in the ocean. Over the past 20 years, shark diving has generated US$800 million for the Bahamian economy. In protecting these animals, we protect the health of our oceans and our economies." Worldwide, up to 73 million sharks are killed every year, primarily for their fins, which are valued for their use in shark-fin soup, an Asian delicacy. As a result, 30 percent of the world's species are threatened or near-threatened with extinction. For an additional 47 percent, scientists lack sufficient data to properly assess their population status. The Pew Environment Group is the conservation arm of The Pew Charitable Trusts, a nongovernmental organization that works globally to establish pragmatic, science-based policies that protect our oceans, preserve our wildlands and promote clean energy. www.PewEnvironment.org .